Freddy has revolutionized shelving! Until now, shelves were inflexible, and had to be planned and mounted carefully. Freddy breaks new ground: with just two different sized wood boards, shelves can be put together in a very short time in any shape and size. You can make cabinets, sideboards and bookcases. Freddy is available in white and with durable DD fine-textured paint, so metal objects won't leave any scratches. Accessories like doors, drawers and cd-holders round off the freddy idea. 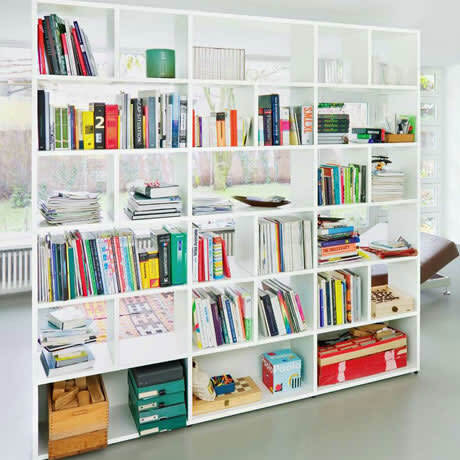 shelf system of melamine coated wood, white. The continuous development of innovative and flexible furniture is Flötotto’s highest priority. Do you have a question about "Freddy"? How can we contact you?